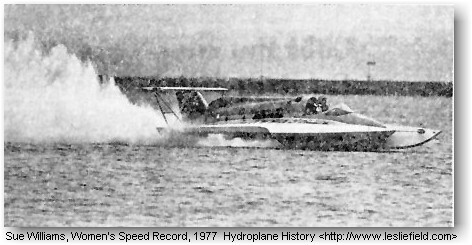 They call her Seattle Sue and yesterday on Lake Washington she became the fastest female ever to step on the throttle of an unlimited hydroplane. Sue Williams, a 28-year-old Boeing worker and a limited boat racer, piloted the U-96 KYYX unlimited to a measured mile clocking of 163.043 miles per hour. Williams, who competes against her husband, Gary, in the 225 cubic inch limited hydro ranks, set the record on her second try early yesterday afternoon. The mile course went from south to north, starting not far from Seward Park and finishing near the Stan Sayres, pit area unlimited layout’s start-finish line. On her first attempt, Williams was timed at a speed of 130 m.p.h. plus — far slower than the 175 m.p.h. time she had hoped to attain. "This thing doesn’t smooth out until it hits 150," husband Gary chided, urging Sue to put her foot into it. She did just that and came in with the record. 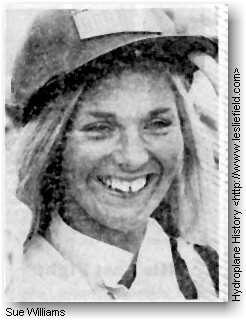 The previous measured mile record for a woman was 138 m.p.h., set at Lake Havasu, Ariz., in a tunnelboat. The U-96 will depart today for Tri-Cities and the Gold Cup race on Sunday. But Seattle Sue won’t be in the cockpit. Owner-driver Peter LaRock will be at the helm.